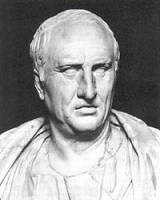 Marcus Tullius Cicero 3 January 106 BC 7 December 43 BC Roman Marcus Tullius Cicero Helvia Cicero Philosopher, PublicSpeaker, Statesman, Lawyer, Poet Roman statesman, lawyer, scholar and writer who vainly tried to unhold republican principles in the final civil wars that destroyed the Roman Republic. His writings include books of rhetoric, orations, philosophical and political treatises and letters. A list of popular Hindi Marcus Tullius Cicero quotes are given below.